You’re a shooter, not a juggler -- just because you want to go hone your art at the range for a while doesn’t mean you should have to fumble around with multiple boxes of cartridges. 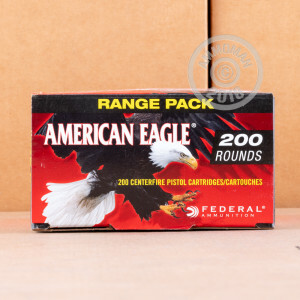 When you buy these 1,000 rounds of Federal’s American Eagle 9mm ammo, you’ll receive five manageable boxes filled with 200 cartridges each. Grab one box, one pistol, and a whole mess of targets, and life’ll never be easier. Another reason for these rounds’ appeal is their great cost. Being proficient with a pistol shouldn’t be a rich man’s talent -- that contradicts the whole notion of firearms as the great equalizer, doesn’t it? When you shoot American Eagle, you can confidently get the most from your handgun without burning your paycheck at both ends. These cartridges feature 115 grain projectiles. The bullets’ full metal jackets make them stellar for high volume shooting, as they’ll preserve your accuracy as they prevent the rapid accumulation of lead residue in your bore. The rounds’ high quality brass casings suit them for handloading as well. 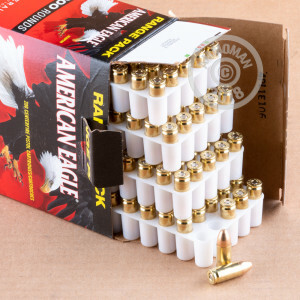 And since we’re on the subject of getting the most out of your dollar, did you know that we’ll ship this whopping box of ammo to your doorstep free of charge? How does it get better than that?